No doubt the northern Gold Coast is one of the fastest growing regions, with Pimpana having been identified by the Australian Bureau of Statistics as the nation’s fastest-growing area and is currently the top housing hotspot in Australia. The Gold Coast has a myriad of planned developments in the pipeline to date, shaping the city into the ultimate lifestyle and tourist hub. And perhaps, it would not hurt to add a mega sports precinct into the mix. 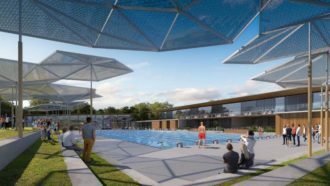 Deputy Mayor Donna Gates has recently unveiled plans for a $56.5 million Northern Gold Coast Community Precinct on Rifle Range Road, Pimpama that will include a water play areas, parklands, flexible event space, two new swimming pools, 12 netball courts, 9 tennis courts and car parks. Construction is expected to commence after the 2018 Commonwealth Games and the precinct will be made available to the public by late 2020.